GB : audio guided tour "the historical heart of Troyes"
We are delighted to welcome you to Troyes, here in the Champagne region. You’ll be setting off to explore a city packed with unsuspected riches. Feel free to stroll along the paved alleyways and remember to look upwards as you pass the fronts of the houses – there are marvels just waiting to be discovered! In case you didn’t know yet, Troyes is shapped like a cork. And not just any old cork either, it’s a champagne cork! Now there’s a funny thing! Together with the Marne, the Aube department is the main producer of this wonderful sparkling wine. Indeed, the town sparkles just like the famous tipple. So, with every step you take, you’ll be drinking in the countless beauties scattered all over the historic capital of the Champagne region. This walk takes you on a journey inside a city which has managed to preserve and display whole chapters of its fabulous past. Unfortunately, the only thing missing is the ramparts which used to surround the city. They were long ago replaced by gardens and avenues. 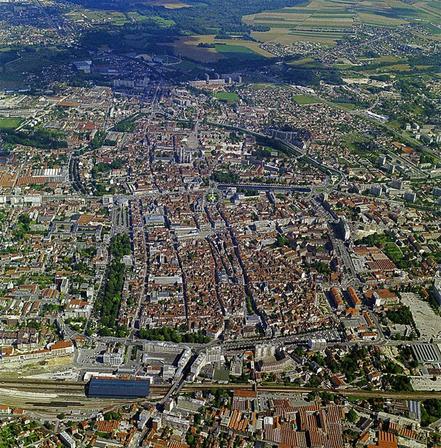 Because, from a bird’s-eye view of Troyes, this is what gives it this unusual cork shape – as you can see on the maps or postcards. The first town to be built here covered a much smaller area. The Tricasses, a small, long-haired Gaulish tribe, decided to settle here in one of the protective meanders of the Seine river. Later on, in Gallo-Roman times, their town went by the name of Augustobona, in tribute to the Emperor Augustus. Then it became Troyes, thus taking it back to its Tricasse roots. Don’t trust the revolutionary motto which appears on the Hôtel de Ville’s / Town Hall? Louis XIII style façade: “Liberty, Equality, Fraternity or… Death”. Oyez, Oyez! On gentle summer evenings, the Ville en Musiques (Musical City) festival chimes out its notes to the four corners of the city. Oyez, Oyez! In the autumn, it is the Nuits de Champagne festival which draws in the crowds with its headliners and talented newcomers. This event, dedicated to the voice and French Chanson, plays host to 1000 choristers who come from all over France. Oyez, Oyez! Throughout the year, the theatres and museums offer the very best in shows and exhibitions. As for the Nuits du Patrimoine (the Heritage Nights) and the 48 Heures d’Automobiles Anciennes vintage car rally, these prestigious events take place one after another every two years! After the spiritual nourishment, let’s enjoy the fruits of the earth! 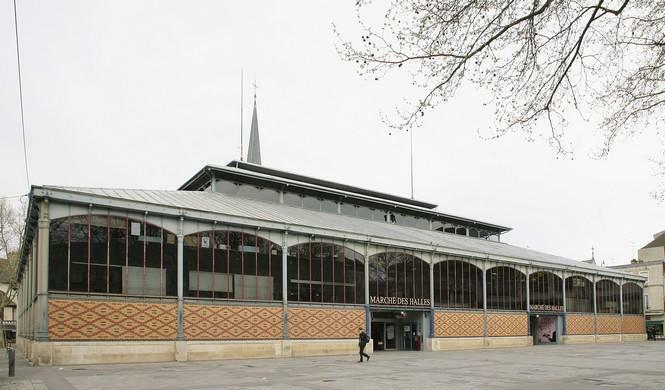 Les Halles “Baltard” (the covered market) which houses the main market was built in 1874 on the site of a school founded by François Pithou in 1562. It was renovated a century later and is still as cool and fresh as ever. Take a little walk around inside to taste some of the best regional produce available, including the famous andouillette! All together now, Mmmmmmm!!! They award it a genuine quality label. Chaource, mmm…, is a creamy cow's milk cheese which has Appellation d’Origine Contrôlée status, as does the divine champagne, and the inimitable Rosé des Riceys. You can also taste Pays d’Othe cider, Brienne-le-Château sauerkraut and all the other farmhouse produce with which this department is packed. On some days the market stretches as far as the square in front of Saint-Rémy, a squat 14th and 15th century church, which is different from the others to be found in Troyes because it has a bit of a country feel and a twisted, properly sharpened spire. No! We’re simply talking about the shape of the town. Seen from the sky, its outline makes you think of the very characteristic shape of a Champagne cork. In fact, these contours are due to the meanders of the Seine and to the imprints left by our ramparts when they were demolished. In their place, the town planners of the time laid out large tree-lined boulevards and large gardens on the filled-in ditches. Don’t be surprised either if people talk to you about the body or the head of the Champagne cork. Long story short, the body is the part that contains the Renaissance structures assembled around the town hall. The head, - where you are now -, is the ancient site of the citadel and the seat of religious power, with the cathedral as its major symbol. The Haute-Seine canal creates a pleasant link between these two, just between the Prefecture and the Hôtel-Dieu-le-Comte. The romantic city of Troyes tells its story not only through its charming and alluring features, but also through the characters and events that have contributed to its fame. Because of its shape – similar to that of a champagne cork – it has been said up to now that Troyes had a body and a head. 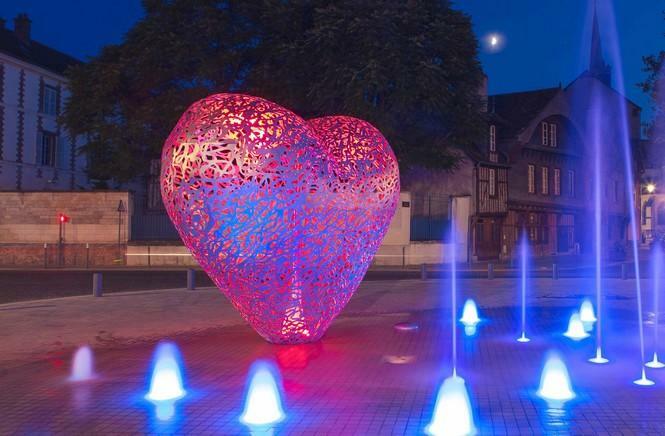 The city now also hosts a heart, in the form of a sculpture by local artists Michèle and Thierry Caillaud-Houël. The artwork takes pride of place at the center of the renovated canal wharfs. The disused canal forms a dividing line of water between the head and the body of the cork. At night, the heart beats with light. This is therefore the real heart of the city, both literally and figuratively. Troyes, the city of courtly love. Troyes is the homeland of Chrestien de Troyes, inventor of the modern novel and bard of courtly love. In addition to the noble values of his gallant knights of the Round Table, the poet introduced us to another virtue: the capacity to be impassioned by the beauty of a woman. “Qui aux dames ne porte honneur, c’est qu’il n’a point d’honneur au coeur” – he who shows no honour to ladies, has no honour in his heart – explains Percival’s mother to her uncouth son who will later learn the virtues of tenderness in the arms of the sweet Blanchefleur. Could it be that Percival’s quest for theHoly Grail was just that: the search for the love of a woman? Similarly, Theobald IV known as Le Chansonnier (the singer), the last Count of independent Champagne and ruler of his fiefdom from Troyes, was not only a great warriot, but also a man of letters. The poet and knight wrote a number of songs, extolling the virtues of romantic love. “Dame, quand je fus devant vous et que je vous vis pour la première fois, mon coeur tressaillit tant qu’il vous resta à mon départ » - lady, when I was before you and I saw you for the first time, my heart trembled so that it remained yours when I took leave (excerpt from the poem “Je suis comme la licorne” – I am like the unicorn). 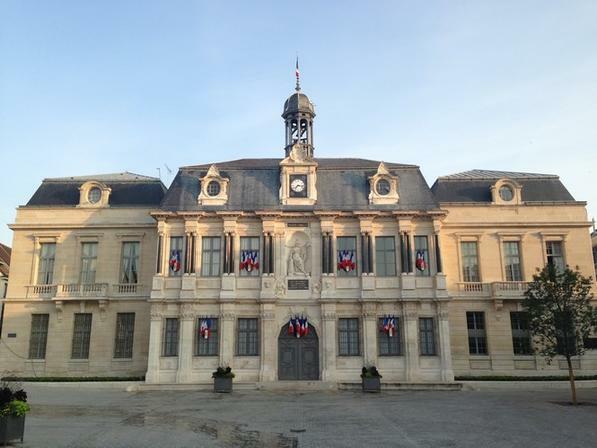 The Love Court of Troyes… Where does the expression “to court someone” come from? Well, there were just a few cities in France which had the priviledge of holding / hosting? love courts, where matters of the heart were examined. Troyes was one of these cities. The hearings were presided over by a prominent lady of the Kingdom, and disagreements between spouses were arbitrated and moral issues debated. The only references that the court had to adhere to were the rules of courtly love, by which any individual of good standing must conduct themselves. They were guided by principles such as “une amante ne doit jamais abandoner son amant pour cause d’absence prolongée” – a lady must never leave her lover due to a prolonged absence. He who goes to war shall not lose his place! Troyes and the Aube region / department were a land of romanticism for centuries. There was once a time when kings and queens would choose Troyes as a place to marry. Louis X, the quarreller of France and Henri V of England, for example. It was a time when the text “The art of courtly love” was written by Andreas Capelanus, handing down instructions for courtly love in 13 precepts. Many famous couples, both real and ficticious, have also found love in the Aube region: Abelard and Heloïse, Frederic Moreau and Madame Arnoux, Flaubert’s “Sentimental education”, Pauline de Beaumont, and the writer François-Rene de Chateaubriand. With this fabulous heritage, how could we not declare Troyes and the Aube region to be the capital of romantic love? Please feel free to leave your love padlock on the Passerelle Heloïse or on the tree of love in Place du Préau, not far away from the Lily Rosa sculpture, with its Lili Rosa love roses, creation of the Hungarian artist Andras Lapis. You can also visit our very own Jeune fille qui donne un baiser (Young woman giving a kiss), at the crossroads of Dampierre’s quay and Clemenceau street. This 5-feet high sculpture was designed by the Dutch artist Sjet Jacobs. Let’s begin with the story of the Hôtel-Dieu le Comte. It’s a former hospital founded in the 12th century by Henri 1st “the Liberal”, Count of Champagne, a powerful, generous man. The current U-shaped buildings were erected in the 18th century. They were converted into a hospice, and were then closed in 1988. They’ve now been renovated and house a university. The Hôtel-Dieu is enjoying a new life with its young students! On the Quai des Comtes de Champagne side, one of the pavilions of the Hôtel-Dieu-le-Comte is the home of the Pharmacy Museum. It’s easy to spot: just look up and you’ll see an imposing sundial on the facade. The apothecary’s house is unique of its kind, containing a laboratory and a pharmacy in which an astonishing collection of 18th century painted wooden medicine boxes known as “silènes” is on show. Interested? You’ll also find hundreds of examples of beautiful porcelain, glassware, pewter, majolica, “albarelli”, pill-boxes and tripods. A paradise for amateurs and connoisseurs alike. 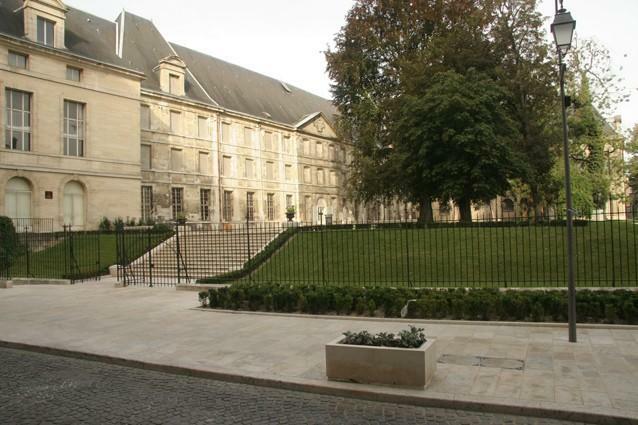 As you walk along rue de la Cité, take a look at the main courtyard of the Hôtel-Dieu. 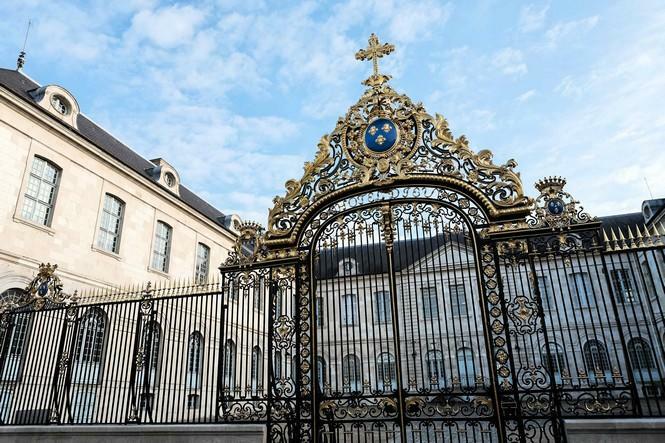 It’s protected by a monumental wrought-iron gate made in 1760 by Pierre Delphin, iron manufacturer to king Louis XV. Its pediment bears a shield with the arms of France. Let’s go back in time … In 451, Attila, the “Scourge of God”, and the Huns decided to stop at the entrance to the town and thus spare it the pillaging and massacres that they normally indulged in. Why? It’s a mystery! Was rue de la Cité too narrow for the barbarian hordes? Certainly not, because the street - known at the time as Agrippa and built by the Romans in 22 and 21 BC – was a major communication route between Milan in Italy and Boulogne-sur-Mer in Northern France. Our Gallic town of the Tricasses tribe, which became the Gallo-Roman Augustobona Tricassium, was not protected from invasion any more than other towns. So some sort of miracle took place and it’s said that Bishop Saint Loup in person went out to meet the barbarians and found the right words to convince Attila not to cross the bridge leading to rue de la Cité. Legend has it that he was then taken as a hostage to the banks of the Rhine. But all’s well that ends well … and the happy man was then miraculously set free and was able to return to the town, safe and sound. 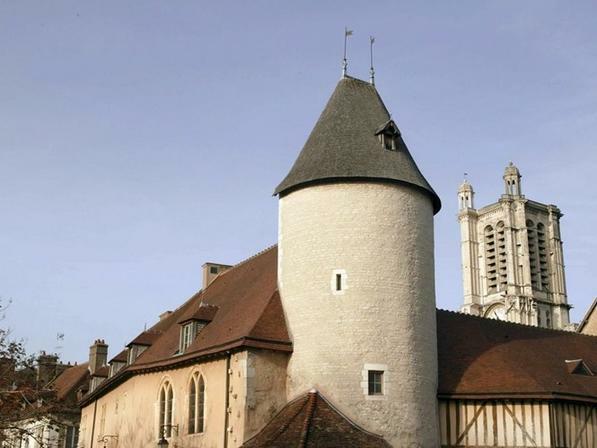 A great historic figure, Rachi (born in 1040 and died in 1105), lived in Troyes. 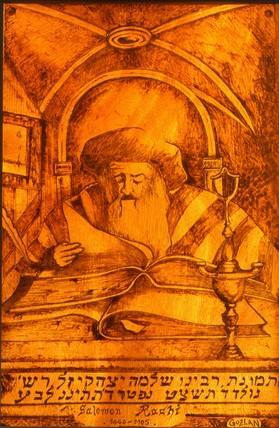 The name of this scholar, who interpreted the Bible and commented on the Talmud, resounds throughout the world, associated with the town of his birth in which he grew up and studied. In the 11th, 12th and 13th centuries, the Jewish community in Troyes was granted special protection by the Counts of Champagne. Jewish families, including that of Rachi, lived in the Saint-Frobert district, which covers rues Hennequin, Saint-Frobert, du Paon, des Cordeliers, Audiffred and Boucherat. Rachi was also a winemaker and grew vines on the site of the current rue Hennequin (so it’s said…) and lived in rue du Paon, but we don’t know exactly in which house. The nearby church of Saint-Frobert, built on the site of the former synagogue, was destroyed by fire in 1830. The surviving building is no longer used for worship. Having been a garage, the former church is now a house. 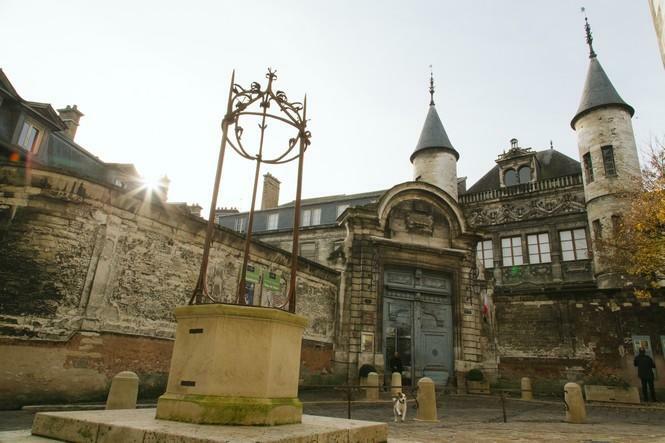 At the corner of rue de la Cité and Quai des Comtes de Champagne, there was once a gate that marked the entrance to Troyes’ Jewish quarter. When you’re in the body of the “cork”, don’t miss out on heading to rue Brunneval to discover the synagogue (depending on its opening times) and the development of Rachi’s work. We’re outside Troyes’ detention centre. In 1792, the former Cordeliers monastery gave way to a prison. From its construction in 1263 to the Revolution, the monastery was one of the centres of spiritual, literary and artistic life in Troyes. And even of municipal life. What’s it got to do with the town hall? Simply that, before the Town Hall was built in the 17th century, council meetings were held in the monastery refectory. Edmond Boucherat, the first mayor of Troyes, was elected there in 1493. 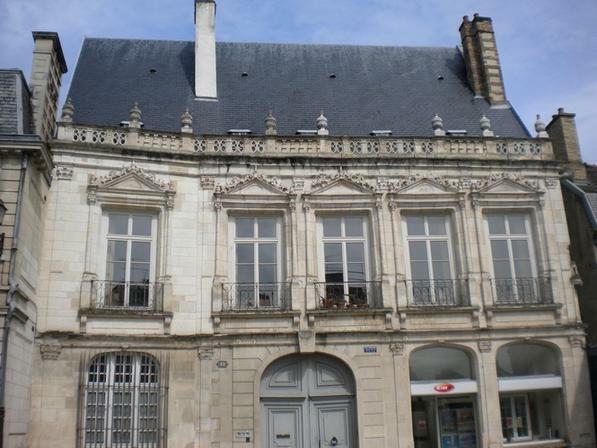 Later, Troyes’ first library, one of the oldest in France, was founded here in 1651, thanks to Jacques Hennequin, who gave his name to the street. At the time, people came from far and wide to consult the 4,680 books in the library. Many of its precious manuscripts are now kept in the Troyes Media Library. Would you like to see a treasure? … Then let’s go to the Saint-Loup Museum. 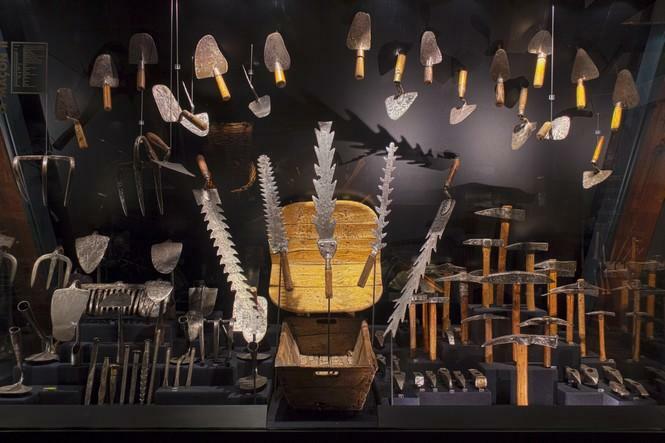 Amongst the thousands of items that it contains, you’ll find the “Pouan-les-Vallées treasure”. This consists of the arms and jewels discovered in the tomb of a great 5th century barbarian chief. The quality of the treasure is often compared to that of the tomb of Childéric I. Now that’s saying something! 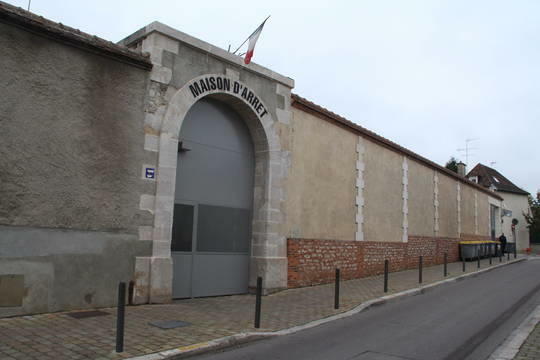 The museum is very old; it was set up on the Saint-Loup Abbey site in 1831. And in the inner courtyard – this is interesting – you can see a dolmen, a menhir and a polishing machine. The collections have filled out over time, with a major section given over to regional archaeology, a presentation of 13th to 15th century Troyes sculptures, a natural history museum (very good for children) and a very broad collection of 14th to 18th century paintings, including great names such as Watteau, Natoire, David, Mignard, Rubens, Belotto, Fragonard, and so on. How did such works come to be here? Very simply because a good number of these paintings come from the “revolutionary confiscations” that followed on from 1789. Now, you’ve all heard of the adventures of King Arthur and the Knights of the Round Table, Merlin the Wizard, Lancelot and Percival. And you’ve all heard about the legend of the Holy Grail. All these legends and characters were created or idealised in the 12th century by Chrétien de Troyes, the most important writer of the Middle Ages, who is also considered to be the inventor of the modern novel. The street that goes along the back of the Saint Loup Museum bears his name as a tribute. And the street that follows on from it, rue du Chevalier au Lion, is named after one of his works. With its 114-metre length, Saint-Pierre-et-Saint-Paul is one of France’s largest cathedrals. It has had a fairly troubled history. First of all, its construction was spread between the late 12th. XIIIème century and the 17th century! And it still remain unfinished, as one of the towers, the Saint-Paul tower, was never built due to lack of money. The apse, which is the rear, outside part of the building, is the oldest part, while the main facade is the most recent. 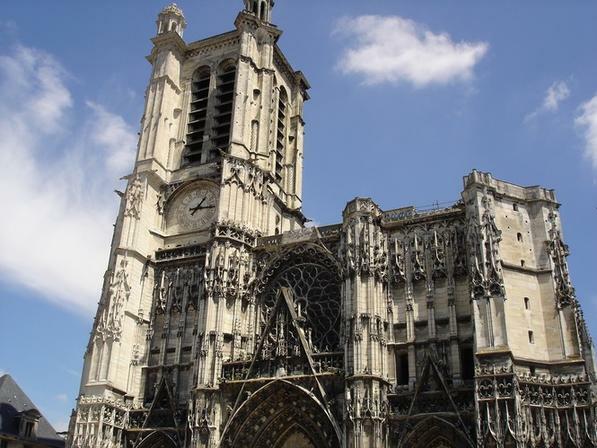 Though it has suffered from bad weather – lighting and tornadoes —, fire and the Revolution, which destroyed all the great statues on the doors, our cathedral is still one of the jewels of Gothic architecture. It is a combination of the High gothic and flamboyant Gothic styles and has retained its architectural unity despite 5 centuries of building. Bravo! Saint-Pierre-et-Saint-Paul cathedral has – wait for it! – 1,500 m² of stained glass windows, a record in France that it shares with Chartres! And its 182 windows offer a unique panorama of the history of 13th to 19th century stained glass. There are also some fine collections of paintings — including a painted panel inspired by Leonardo da Vinci’s Last Supper —, sculptures — which illustrate the creativity of the Troyes School in the 16th century — and liturgical furniture, such as the great 18th century organ from Clairvaux Abbey, which is in our departement. But the cathedral also houses a wonderful treasure, which was pillaged during the Revolution and reconstituted since, thanks to various purchases and archaeological digs carried out particularly in the choir. It contains a fine collection of 12th to 16th century enamels and the shrine of Saint Bernard, which contains the skulls of Bernard de Clairvaux and Saint Malachi. To the right of the cathedral, the former bishops’ palace is now home to Troyes’ Museum of Modern Art. The existence of the palace can be traced back to the 12th century, as illustrated by a Romanesque window discovered during its restoration. Major embellishment works were carried out from the 15th century, and a wing was added in the 17th century. Before you enter the courtyard, where there’s a venerable, majestic lime tree brought back from the Vatican in 1870, you’ll go through a gate decorated with the coat of arms of a bishop of Troyes. The courtyard is surrounded by buildings overlooked by the imposing outline of the cathedral. The bishops’ residence was at the far end. The right-hand wing stands out for its Champagne chequered pattern, - alternating red brick and white chalk - , typical of local architecture. Go across the corridor that leads to the museum entrance and you’ll come to a beautiful French-style garden scattered with modern sculptures from the Georges-Pompidou Centre in Paris. 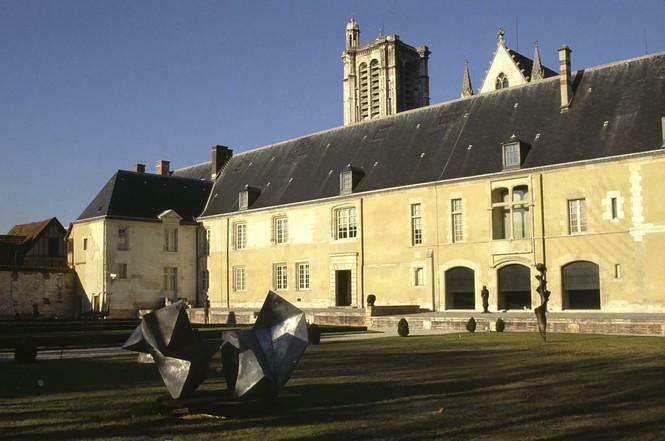 Troyes’ Museum of Modern Art was “born” in 1982. It contains over 2,000 works and has one of the finest and most eclectic collections in France: a mix of paintings, drawings, sculptures, glassware, ceramics and works of art from Africa and the Pacific. The collection comes from a donation by a major clothing manufacturer and enlightened art-lover from Troyes, Pierre Lévy, and his wife Denise. Pierre Lévy was chief executive of the international Devanlay-Recoing company, which makes LACOSTE clothing and still has production units in Troyes. The paintings on show are an extraordinary reflection of major painting trends between the 1850s and the 1950s, a fertile period for all kinds of research and exploration: realism, neo-imperialism, pointillism, nabi, fauvism, post-cubism, the Paris school, abstraction and miserabilism. You’ll find all the great names here: the Daumiers, Degas, Courbet, Gauguin, Derain, Braque, Vlaminck, Modigliani, Balthus, Buffet, Dufy, Van Dongen and many others. Hidden away in the shadows of the Etablissements Formont buildings, just opposite the cathedral, an inimitable, quite unique drink is distilled: “Prunelle de Troyes”. The recipe for Prunelle de Troyes actually goes back to 1840, and it was awarded a Gold Medal at the Universal Exhibition in Paris in 1900. Its manufacturing secret is jealously guarded by the Formont family, which has run the Cellier Saint Pierre from generation to generation. This is one of the jewels of the region’s gastronomic heritages, much loved by its loyal customers, men and women alike, and discovered with enthusiasm by tourists on their way across the cathedral square. So, there’s a good way – along with Aube champagne - to persuade you to come back to Troyes… A little taste of… come back for more, as they say! When you’ve had a little taste, have a look at the chapter house cellar in the courtyard – you’ll recognise it by its sloping roof. The canons stored their wine and wheat here in the olden days. Its timber-work dates back to the 13th century and specialists say that it’s one of the oldest in France – for a civil building, that is. Rue Linard-Gontier bears the name of a master glassmaker from Troyes who, in the 16th and 17th centuries, gave the art, omnipresent in Troyes, a new lease of life. 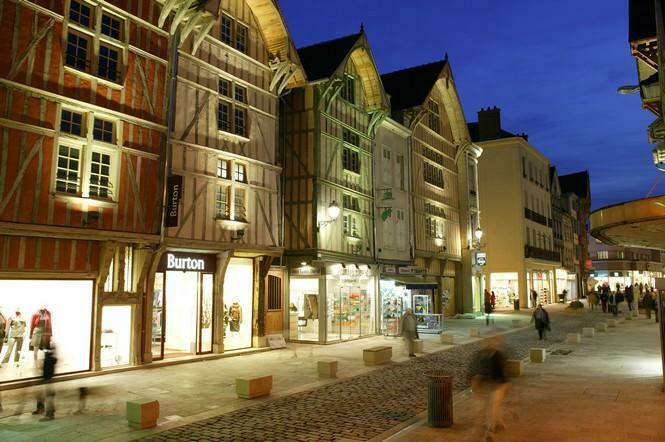 The street is one of the most picturesque and characteristic in Troyes. 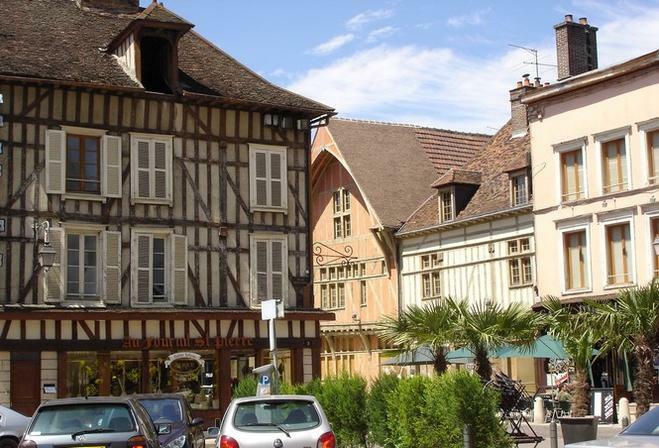 It contains two character hotels, particularly successful examples of the restoration of our heritage from Troyes’ “great 16th century”, as we say here. Let’s get technical for a moment! 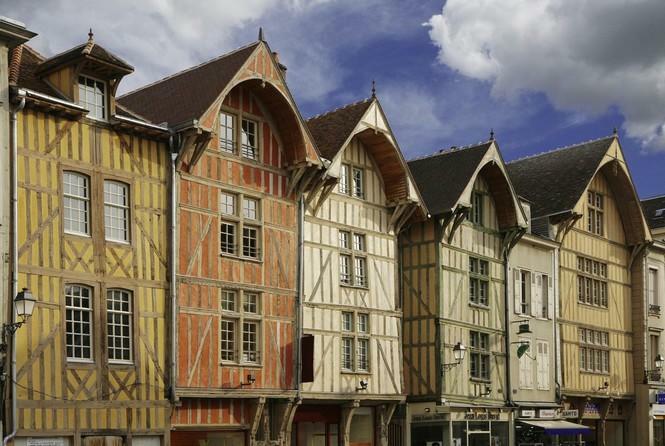 Troyes has one of Europe’s biggest collections of timber-framed houses, some with three floors and an overhang. Most of them were built during the Renaissance; their structure consists of a visible oak frame resting on a stone or brick base and filled with cob, a mortar made of clay and straw. The whole structure was then covered with lime and coloured pigments to paint the building in red, green, blue, yellow… a rainbow of colours to delight the eye… and the photographers! The Hôtel du Petit Louvre owes its name to the famous Louvre Palace in Paris, the symbol of royal power. 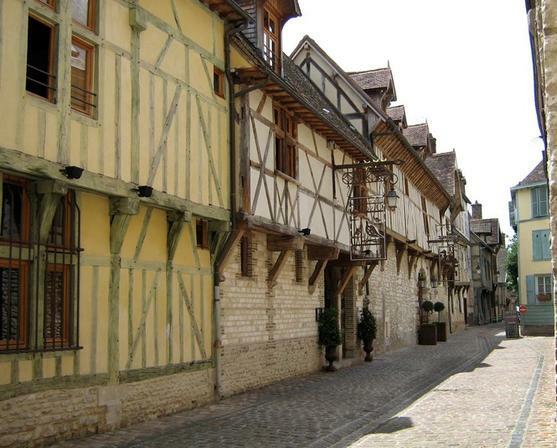 This magnificent complex is very representative of Troyes’ timber-framed architecture. It was built, or rebuilt, in stages, between the 16th and 18th centuries. The buildings in this former canons’ residence (canons were priests appointed to the cathedral) are laid out around a square courtyard, where you can see a 16th century wrought-iron well with three pulleys. A number of famous people have lived in the Hôtel du Petit Louvre, including bishops such as Henri de Poitiers, bailiff, bishop and governor, and Odard Hennequin, bishop of Senlis, then of Troyes. It was also used as a coaching inn between 1793 and 1839, accommodating coaches covering the route between Troyes and Paris in thirty hours. Its renovation in 1988-1989 provided an opportunity to rebuild the semi-circular tower that had been erected in the 13th century on the site of the town’s Gallo-Roman ramparts. During these works, modern architectural features were intelligently added to the old buildings. The painted beam-ends were of course retained. Carved by craftsmen, they portray characters that are sometimes grotesque, but you’ll see that they’re full of charm as they smile at you. The verdant Place du Préau is, in a way, the counterpart to Place de la Libération, from which it is separated only by the former Haute-Seine canal. 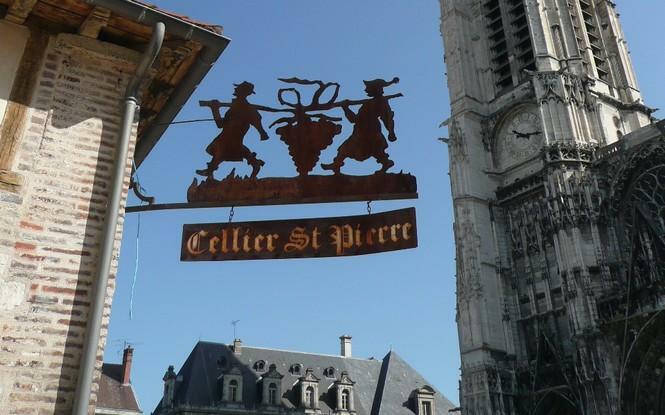 In the 12th century, Count Henri 1st the Liberal, who governed Champagne at the time, had had two buildings erected here: his palace and an even larger church, the collegiate church of Saint-Etienne. The Count’s residence and chapel were side by side, like Siamese twins, so palace residents could easily move from their apartments to the vast church for religious services without having to go outside. The collegiate church of Saint-Etienne was one of the first Gothic-style religious buildings in the region and was almost identical to the church of Saint-Germain-des-Prés in Paris and Saint-Quiriace in Provins. Sadly, the palace and church were demolished after the Revolution. Thanks to Napoleon I, the Haute-Seine canal was built on the site, and can still be admired today. This great dock served as a timber port up until the Second World War. As you walk up the Quai des Comtes de Champagne, you’ll be following the fortunately preserved part of the Haute-Seine canal in Troyes. At the corner of rue de la Cité, stop for a moment outside the “Maison du Préposé aux Ponts Tournants”. 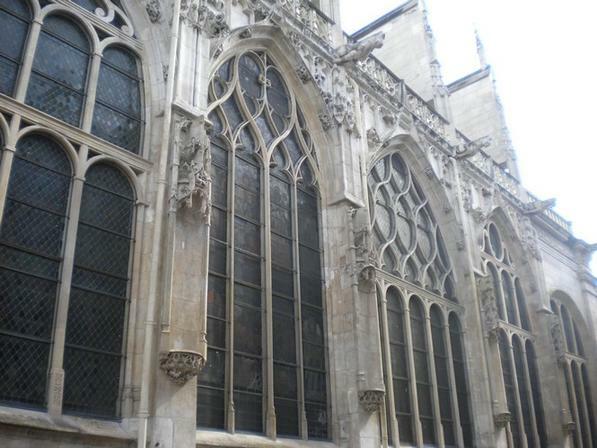 In Troyes, stained glass is the memory of glass! And the town is nicknamed “The holy city of stained glass” by the specialists. The reason is simple: in the Aube department there are some 9000 m² of stained glass windows, half of the amount in Champagne-Ardenne, a region that itself contains half of the stained glass in France. You can see why all our churches are so lavish. In the 15th and 16th centuries, the Troyes school of glass painting dominated the French scene. The Troyes school’s early period is marked by laboured design and very bright colours – a wonderful multi-coloured festival! Influenced by the Italian Renaissance, the second period abandoned colour to concentrate on shades of grey on clear glass. The master glassmaker Linard Gontier then returned to lively colours: this was the Troyes school’s swansong. Stained glass windows are to be read like a comic book: from bottom to top and from left to right. It initially showed religious scenes recounted in a number of juxtaposed tableaux. It then introduced scenes of daily life in which craftsmen occupied an important place. The rich people who ordered these windows also had themselves represented from time to time… with little modesty. Discover the fascinating world of stained glass at the Cité du Vitrail on the corner of quai Dampierre and rue Roger Salengro. The exhibition center has a permanent collection which brings together stained glass from ten different centuries, from the 12th to the 21st. The 25 works on display which are both secular and religious are changed by the center regularly. There are also some interactive areas where workshops are held, as well as game and films for visitors to enjoy. 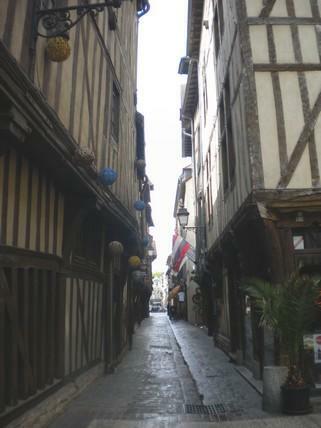 In the 12th century, the Counts of Champagne had created the “Troyes diversion”. This was a complex, well-designed water network that divided the Seine into two parts. The “Old Seine” still by-passes the town, while the “Town Seine” is divided up into innumerable canals, brooks, sluice gates and ditches. Some of these waterways had a defensive function, like the ones that flowed along the ramparts. Boulevard Barbusse is an example of this, even though all the ramparts are gone today. 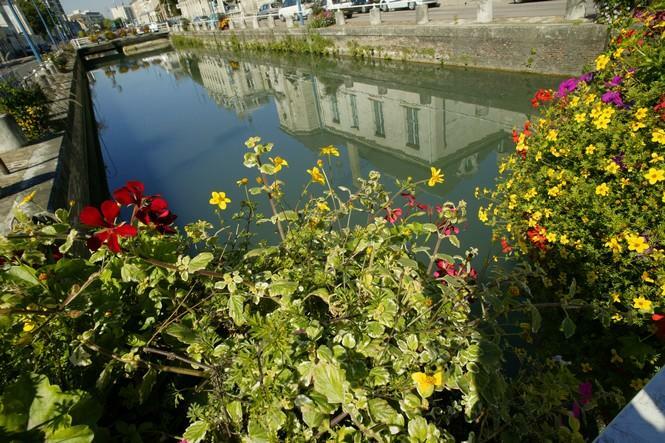 Today, some 120 km of waterways still flow peacefully through the Troyes conurbation. But there’s nothing to worry about now, since the reservoir-dams were built on the Seine (some 20 km from Troyes in the Forêt d’Orient… which, by the way, is a nice place for a walk), removing the risk of major floods like the one that occurred in 1910, which stays in the memory / which people still remember today ? Many of these waterways have disappeared as the town has developed. But some have re-emerged as a result of new development. For example, the university campus was built behind the cathedral, on a site through which the Canal de l’Isle once flowed and now flows again. Located at the foot of the Prefecture and the Departmental Council Offices, the Place de la Libération is full of history. It’s also a pivotal point in Troyes as it lies at the junction of the two parts of the town, forming a link between what we locally call “the body and the head of the Champagne Cork”. We’ll find out why later. 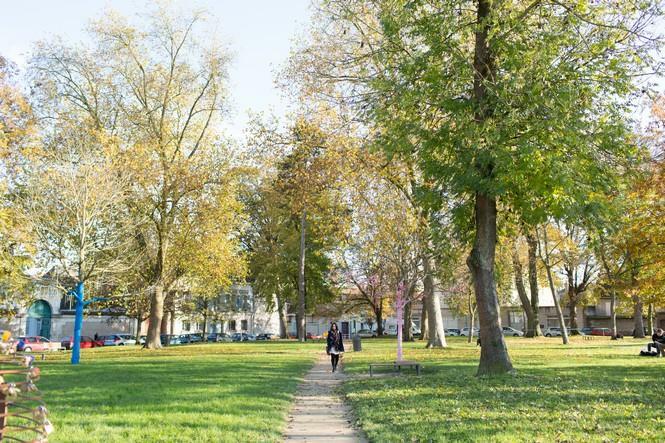 The square was built on the site of a former cemetery and a double church that was demolished in the late 18th century and replaced by a short-lived grain market. 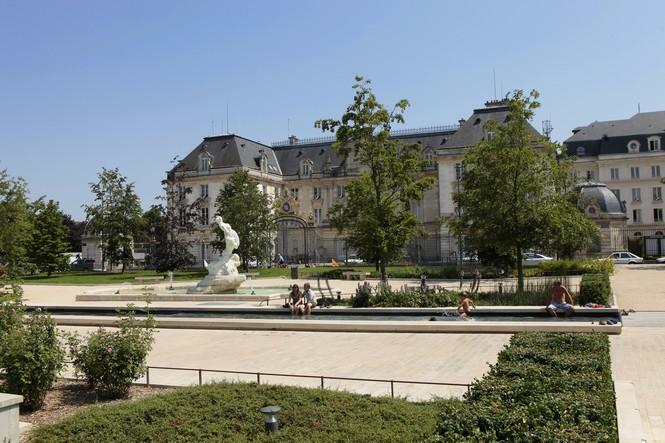 It has been renamed many times and undergone a series of transformations; the charming provincial square used by the people of Troyes throughout the last century has given way to a resolutely modern urban park. Beneath the garden is a spiral-shaped underground car park that has a special feature well worth seeing: its 7 levels are decorated with 150 m² of contemporary stained glass in a sort of allusion to the nearby Saint-Urbain basilica. 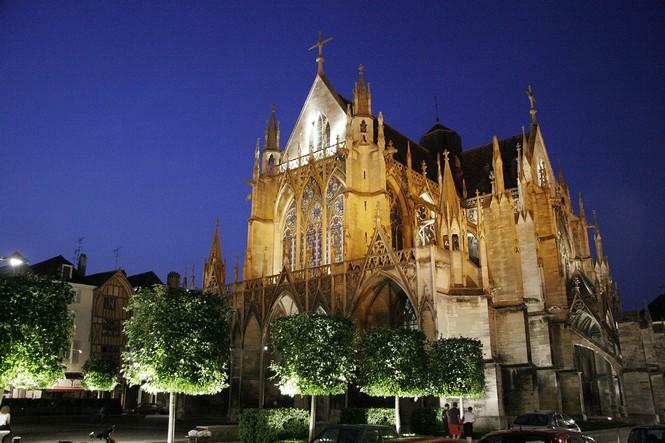 People come from all over the world to admire Saint-Urbain, THE basilica in Troyes. This radiant Gothic jewel dates back to the end of the 13th century and has long attracted words of praise for both its architecture and its stained glass windows. Saint-Urbain owes its favour to the only Pope ever to come from Troyes, Urban IV. That was in 1262: Jacques Pantaléon, the son of a modest cobbler, became the supreme pontiff at the end of a brilliant ecclesiastical career. It was he who started the festival of Corpus Christi. He then decided to have a collegiate church built on the site of his family’s stall. Even though it was only completed in 1905, right from the end of the 15th century, the basilica of Saint-Urbain was decorated with a rich statuary. Artists came in droves, overflowing with talent. Now this is what we call fine Troyes 16th century work! Here the Troyes School has given us one of the few depictions of Saint-Bernard de Clairvaux. As for the Vierge au Raisin (the Virgin with the Grapes) - among a whole host of other masterpieces - she symbolises the bliss of sacred art. The gentleness of her smile and the richness of her drapes illustrate the return to prosperity. What do people get up to in Troyes? They ring! Or so goes the old saying. The city has numerous bell towers. But there’s no point twisting your neck trying to admire the steeple of the impressive church of Saint-Jean-au-Marché, just in front of you, which was built way back in the 13th century. Yes indeed! Its bell tower collapsed without a single warning peal one night in May 1911. It fell onto the house opposite, which was a patisserie. The restoration work on this church, which was almost large enough to rival Troyes cathedral, got underway and Saint-Jean was gradually restored to its former glory. as well as the baptism of Marguerite Bourgeoys (the founder of the Congregation of Notre Dame of Montreal). This must’ve been one of the liveliest squares in the city back in the Middle Ages. It owes its name to the bakers, who used to come to make their bread and sell it by the loaf, so it became known as the Place du Marché-au-Pain (meaning Bread Market Square). Before that it had been called the Place du Marché-aux-Herbes (Herb Market Square) - no prizes for guessing why. However, freshwater fish merchants used to gather here as well to harangue the peasants. The elegant well you can see here comes from a neighbouring square, the Place Audiffred, formerly known as the Place de l’Etape-au-Vin… There used to be almost eighty wells like this one, all over the Bouchon de Champagne (Champagne Cork) area. Most of them disappeared in the 19th century with the invention of pumps and the appearance of fire hydrants. As well as providing a water supply for households and for the construction industry, these wells played an important firefighting role. Troyes saw some dreadful fires! For aesthetic reasons, wells have been restored to their rightful place in the heart of Troyes. If you keep your eyes open you will spot some more, for instance the one in the Rue Emile-Zola. Troyes lies halfway between Flanders and Italy. Back in the Middle Ages it was a genuine hub of European trade, thanks to the fairs held in Champagne and Brie. The "warm fair” held in June and the “cold fair” in October really started to grow under Thibaut II. Ah… Now there was a Count who knew how to count. And to keep on attracting increasing numbers of merchants, who brought prosperity, he had the bright idea of offering them protection on the roads and paths leading to Troyes. Armed with safe-conducts they came in droves... Men from the Mediterranean with bags full of spices and silks, men from Germany with their leathers and furs and men from Flanders with their fabrics. These trade links then led to the setting up of foreign exchanges on the street corners of a city which became a vitally important money market. The Champagne denier was rather like the euro of its day and the Troy pound was used to weigh precious stones, as it still is today in Great Britain. This street, the Rue de la Montée-des-Changes is a reminder of the affluent days of the money changers and the city’s economic prosperity, as at the same time it took on intense political, spiritual and cultural influence. The county fairs reached their peak in the 12th and 13th centuries and finally declined in the 14th century. You are now in the Rue Général-Saussier. This is a tribute to a great servant of the army, who ended his career as military governor of Paris. Before it was renamed in 1906, the street took its name from some other soldiers: soldiering monks! Do you know who we mean? 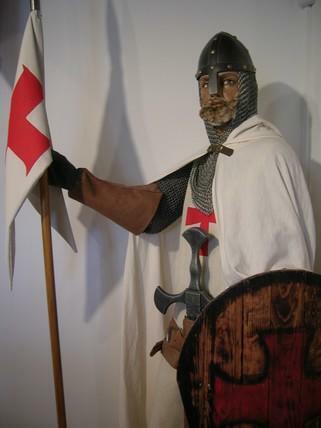 Yes, it’s the famous Knights of the Temple of Solomon in Jerusalem, better known as the Knights Templar. They had quite a stormy history! This takes us back to the time of the Crusades, and many of the lords of Troyes and the surrounding area took part, starting with Hugues de Payns (who took his name from that of a neighbouring village). He founded the Order of the Temple. The rules of this order, which is both religious and military, were largely drawn up by Saint Bernard de Clairvaux and approved at the Council of Troyes, in 1128. The Hôtel de la Commanderie du Temple, at number 3, was built a long time after the order had disappeared by Commander Bruslard de Sillery (in 1639). Indeed, for a long time this part of town was known as the Quartier du Temple. Because of their many possessions, it was also known as the “Triangle d’Or” (the Golden Triangle)! The Compagnons du Devoir (Companions of Duty) could not have chosen a finer place to show off / their know-how than the Hôtel de Mauroy! 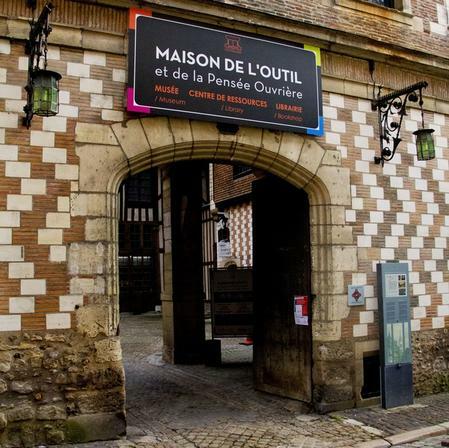 You really should visit this amazing museum: the Maison de l’Outil et de la Pensée Ouvrière (literally "the House of Tools and Working Thought") is a case in which the jewels are – oh yes! - files, hammers, trowels, chisels, planes, etc. all of them with a patina they have got from men’s hands. The museum is like a hymn to the manual crafts. Some people go even further and call this the worker’s Louvre. As well as the ten thousand old objects all cleverly displayed, it also houses a library containing mountains of books on both crafts and craftspeople. This astonishing collection was started by Father Paul Feller, who was one of the founders of the Maison de l’Outil and items are still being added to it today. You can also admire and enjoy the architecture of this building steeped in history. Back in the 15th century it had been called the Hôtel de l’Aigle. In spite of all the different things it has been used for, the Hôtel de Mauroy has retained all of its character. It is still certainly the finest example of a construction using the “Champagne checkerboard” method, with overlapping brick and chalk! Rue Emile-Zola – still called “Rue Milo” by some of the older locals – is the biggest and busiest shopping street in the city. At the heart of the urban renovation project, it was, as if by magic, transformed from head to toe, to provide shoppers with more room. Pedestrian streets are gaining ground in this city which has so much to offer; so beautiful during the day and so radiant at night. Number 107 stands the former Jorry-Prieur department store, for instance, next to which you are standing, and it is characteristic of the metallic architecture and feats of engineering of the 19th century. As you will have understood, Troyes has decided to restore its Renaissance heritage to all its former glory, along with its incredible heritage from the industrial age. You've probably heard about church museums, but have you ever seen one? 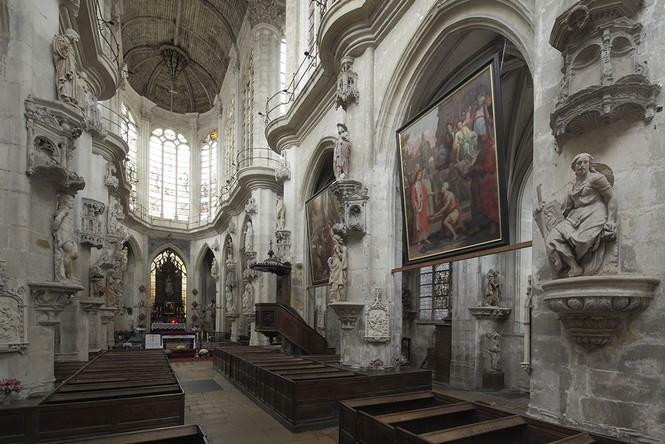 Saint-Pantaléon, the most baroque of Troyes’ churches, is one of them. It is full of saints and martyrs set into the stone. In all there are sixty or so 16th century polychrome statues some of which are attributed to Dominique, known as The Florentine. This artist, originally from Florence, was popular with François Ist and took advantage of an interruption to work on the Château de Fontainebleau, where he was working, to set up his workshop in Troyes. It was a good job he did! The 16th century grisaille stained glass windows rival the wooden arch of the nave which seems to be sucked up towards the sky for beauty and lightness, it really is superb! Vauluisant is a shortened form of "Vallée Luisante" (Shining Valley) and is a dazzlingly authentic part of the city, a real maze of alleyways and small courtyards. It takes its name from this elegant townhouse, called Le Vauluisant, which itself inherited the name from the Cistercian abbey in the Yonne region, adjacent to the Aube, called Vauluisant Abbey. 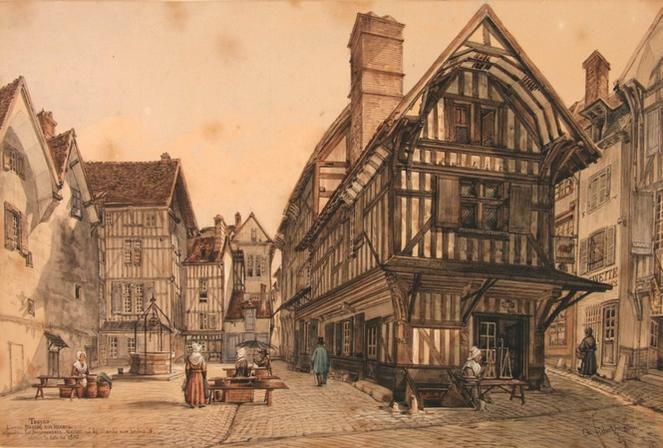 It had a residence right here in Troyes, but it was burnt down in the great fire of 1524. The current dwelling dates back to the 16th century. The two arrow-shaped towers, which frame the main building, invite you to visit a pretty museum devoted to the city’s history and busy artistic life. Climb up the spiral staircases and take a trip back in time. These walls still house the hosiery museum. And indeed! The night bonnets led to hosiery. Before belonging, at the time, to the Paillot de Montabert family, whose name lives on as that of a street in Troyes, this graceful stone house had been built by the dyer Nicolas Largentier in 1536. Although it was once known as the Hôtel de Clairvaux, his son, the Baron de Chapelaines, renamed it. It is reported that on 8th February 1814 this fine house in the Rue Turenne was the venue for the meeting of three allied monarchs, Emperor Francis Ist of Austria, the King of Prussia Frederick-William III and the Tsar of Russia Alexander Ist. They were all determined to bring down Napoleon I, and it was here that they decided on the future of the French Campaign and the fate of Napoleon, soon to be defeated. Nestling against one another, the corbelled houses in Troyes with their roofs that look like circumflexes seem to carry the weight of the years on their shoulders - what am I saying? I mean the weight of the centuries!!! Most of these buildings date back to the 15th and 16th centuries. As is the case here in the Viardin district which is one of the most typical in the city. But although these old ladies may look fragile, made up of pieces of oak and cob – which the flames used to gobble up in the olden days – they’ve managed to stand up to all of these trials, including the test of time. With the gloomy coatings in which they had been covered removed, they are coming back to life, one-by-one, in all their splendour, decked out in soft colours, just as they once were. Because the master carpenters have restored both the pigments of yesteryear and the art of whitewashing. 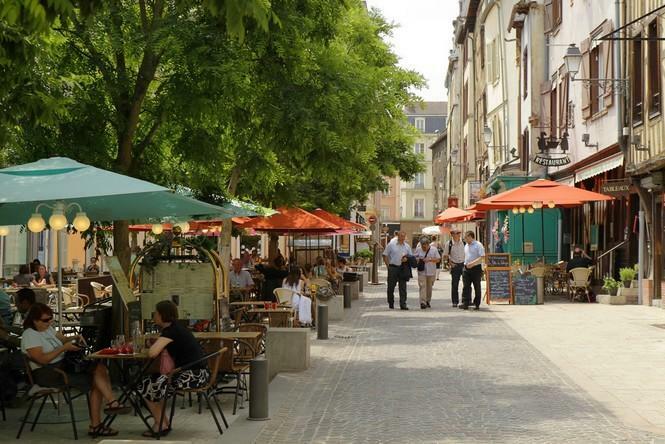 This is why Troyes is having its medieval atmosphere restored, to the delight of both its inhabitants and visitors, who can now stroll around the streets covered in uneven paving stones, and that’s their charm. 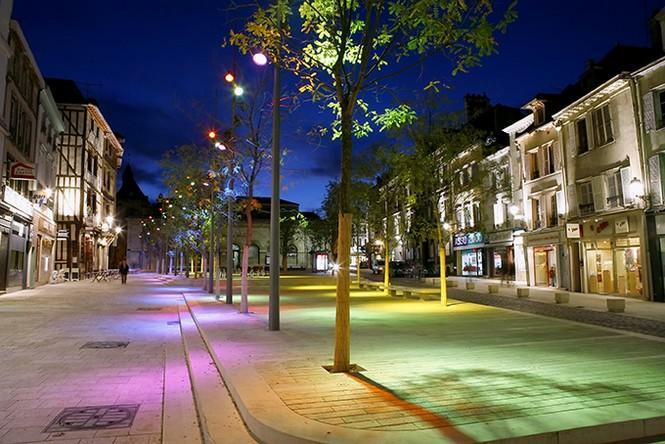 Troyes, the city of a thousand colours! Take a look at the bottoms of the gutters: there are dolphins spitting out water. Look upwards: underneath the skylights, there are pulleys enjoying a well-earned rest. One of the most important statesmen ever to have grown up in the Aube region was born in a house in this square, at number 28. A medallion with an effigy of Edouard Herriot is a reminder of this brilliant writer who became embroiled in politics. This modest plaque tells you that the future President of the Council was born here, on 5th July 1872. However another man of letters and politician, Victor Hugo, did not like this triangular square where the scaffold used to be set up and said so in his famous novel, Claude Gueux. Yes indeed. That was then… The square is getting ready to come back to life, just like other parts of Troyes: the area around the railway station and the Place Saint-Nizier for instance, remodelled by great urban architects such as Jean-Michel Wilmotte. The imposing rectangular building with round-arched windows which blocks off the top of the square and masks the chevet of the church of Saint-Nicolas has been the Bourse du Travail (Labour Exchange) since 1905. Before that it used to be the hosiery market. The manufacturers used to come to sell their textile products at sixty-five counters. In other words these were like early “factory shops"! 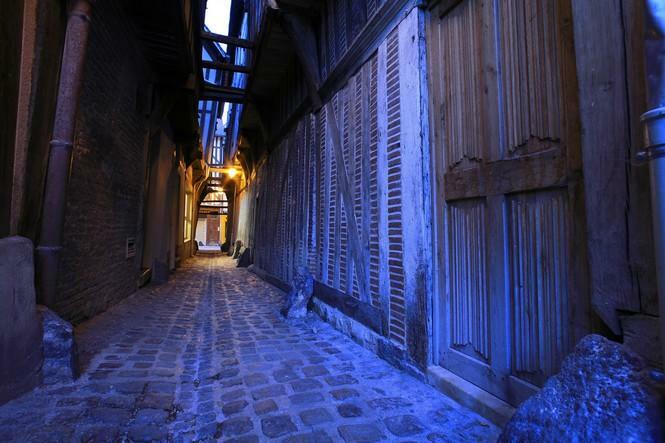 Here is the highly picturesque Ruelle des Chats, with its lopsided houses, its battered boundary stones and its worn-down, original paving, with all the atmosphere of the Middle Ages! Did you know that around here, at nightfall, you can sometimes still see cats jumping from roof to roof? That’s why the felines gave their name to this lovely alleyway. So if you take the time, you can find the face of a cat sculpted onto a beam end! Look out! Now you’re in what looks like the set of a cloak-and-dagger film. You can easily imagine a duel between gentlemen wearing wigs in the porch leading to the Mortier d’Or, followed by stunts in the galleries which overlook this courtyard. The beam ends are decorated with warriors' heads, suggesting that this building once belonged to a high-ranking soldier. Now that’s real class! Don’t leave without stopping to admire the sculpted pilasters framing the door which leads out onto the passageway into the Ruelle des Chats. Although the building dates back to the 12th century, most of it underwent alterations in the 16th century. 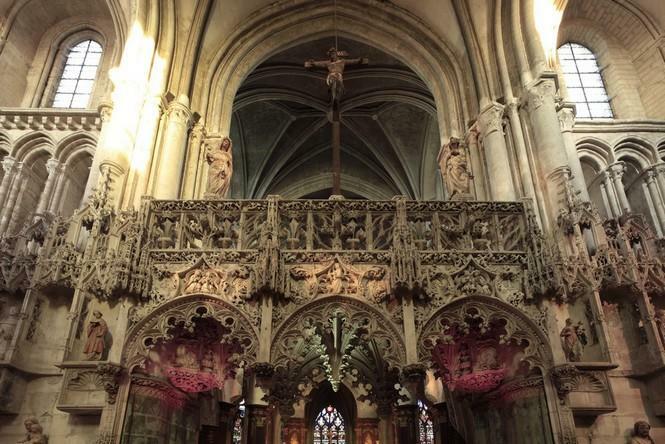 Walk in through its flamboyant main door and you will find a masterpiece of a kind you will find hardly anywhere else: the rood screen of the Madeleine. The rood screen was used to separate the chancel from the nave. Oh… It’s a little jewel of chiselled stone, three arches of pure lace, hanging between the two large pillars of the chancel. Jean Guailde produced this masterpiece between 1508 and 1517. When he died the local artist was allowed to rest in peace underneath his work for all eternity. There’s an epitaph mentioning that he “is awaiting the blessed resurrection without fear of being crushed”. Take a look at the painful face of Sainte-Marthe as well. This statue, which is characteristic of the 16th century Champagne School, is attributed to Maître de Chaource, It appears to be grieving for Mr Jean Guailde and his enormous talent. And what about the stained glass windows? Look at the way they are bursting with colour, as in the Legend of Saint Louis or the Jesse Tree. But above all, don’t miss the scene showing the Creation of the World! 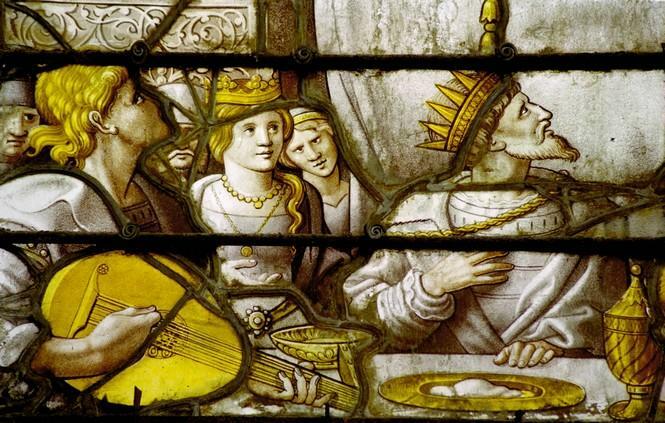 This will help you to understand why Troyes was crowned the “Holy City of Stained Glass Windows”! The street full of bistros and little restaurants is one of the liveliest in the old medieval city. People are out walking the streets with friends until late at night. The City of Troyes’ Cultural Centre has been housed here since 1971, behind the proud half-timbering of the Maison du Boulanger, built in the 16th century. This building, which is used as a venue for exhibitions and literary events, was remodelled back in the 17th and 18th centuries and then restored by the city council in the 1960s. The little square panes of the guillotine windows of the two-storey houses were also decorated with oiled paper. In the Middle Ages there was a sign showing the house’s trade: it used to be a baker’s shop. When you stop to think that these timber-framed walls were almost knocked over like a house of cards back in the days when concrete ruled the world... But fortunately, more than thirty years ago, heritage lovers stood up against the potential perpetrators of this murder by mechanical digger. The burst of enthusiasm for preserving Troyes’ heritage dates back to this battle. You are right in the heart of the area safeguarded by the city. The Rue Champeaux, at the end of the rue Paillot de Montabert, used to be called “La Poulaillerie"! This was because there was once a poultry market nearby. This was a bustling place back in the days when the Champagne Fairs were held. Nowadays its half-timbered houses stand proudly and are very popular with watercolour painters and photographers. Hundreds of artists have put down their easels around the Tourelle de l’Orfèvre, this elegant house which rises up in all its splendour into the full glare of the light as you emerge from the half-light of the narrow Rue Paillot-de-Montabert. At number 26, the Hôtel Juvénal des Ursins, which can be recognised by its three-sided oratory standing in the middle of a very fine stone façade, is a mixture of Gothic and Renaissance architecture. It belonged to the Jouvenels, a high-ranking Troyes family of magistrates. On the wall on the right there is an old-style fresco telling their story. Jean Jouvenel was King Charles VI’s lawyer and provost of the merchants of Paris, an important position in the late 14th century. Over the centuries, many people from Troyes have made names for themselves in France, and some even beyond our borders. - Chrestien de Troyes, the inventor of the novel of chivalry. Who hasn’t heard of Sir Lancelot of the Lake? - or of Rachi, who wrote enlightened commentaries on the Bible and the Talmud. 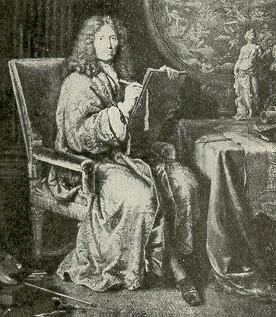 - of Pierre and Nicolas Mignard, a talented painter and architect respectively, called upon by the Sun King Louis XIV to glorify him. While we’re on the subject of history, there's also Charles Baltet, a nurseryman of genius, who created many different varieties of fruit and one of whose vines still grows today at the foot of… Mount Fujiyama, in Japan. 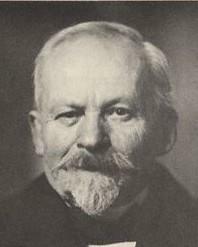 And the timeless Émile Coué, a pharmacist from Troyes who became a psychotherapist and whose method travelled all the way around the world: you know.... the Coué method. And then have been some great sportsmen such as the swimming champion Lucien Zins, the footballer Pierre Flamion or the sailor Luc Pilot. And then we mustn’t forget the cyclists Marcel Bidot and, closer to home, the Simon brothers who have seen life in the famous yellow shirts of the Tour de France. Nowadays there are stage and TV comedians such as Jean-Marie Bigard, Raphael Mezrahi, Tex, etc. who are all from Troyes and proud to be. - Léonie Aviat, also known as Sister Léonie Françoise de Sales, who founded the Congrégation des Oblates of Saint François de Sales. Beatified in 1992, she was then canonised by Pope Jean-Paul II in 2001. - There is also Claudie Pierlot, a very smart modelist and fashion designer whose ‘ready-to-wear’ clothes can be bought throughout the continent! - And it would be a shame not to mention Marguerite Bourgeoys, who took holy orders at the age of 18 and founded the city of Montréal, in Canada! She also founded the Congrégation de Notre Dame, first school for girls of the city at the time. She was canonised a Saint in 1982 by Pope Jean-Paul II. 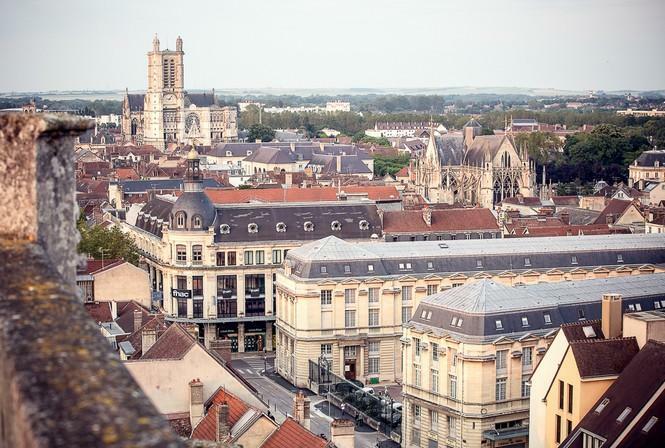 We feel sure that Troyes has surprised you and that you have fallen in love with the city! So why not extend your visit and stay for a little longer? The tourist information office can offer some unusual, varied ideas for all ages and to suit all budgets. And thank you for listening so closely to what we’ve had to say!